The AWS838 wireless stereo headphone system is specifically made for TV, Hi-Fi, and A/V entertainment use.The AWS838 utilizes the state-of-the-art wireless digital audio technology to transmit and receive crystal-clear music up to 100 ft. distance even through wall and floors. It lets you sit where you like and enjoy freedom of movement without the hassle of wires while watching TV or listening to music. The AWS803R lightweight headphone features the special design of comfortable closed ear-cup or compact closed on-ear style. Both styles can effectively enhance powerful heavy bass and isolate ambient noise. 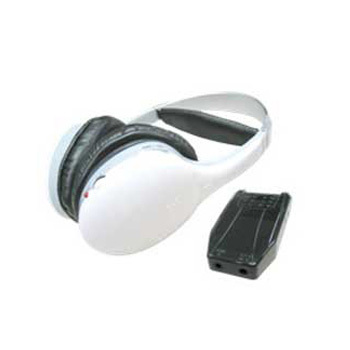 In addition, the comfortable ear-cup style provides the soft cushion ear-cup with ergonomic design that comfortably covers your entire ears, while the compact closed on-ear style provides the softly padded ear cushions that gently conform to the shape of your ears. All these ensure a powerful bass and crisp mids and highs reproduction with exceptional quiet background and ultra-comfortable wearing. Watching TV or DVD Video. Listening to music from Notebook or Desktop PC.